A new boutique hotel is bringing a chic vibe to NYC‘s Times Square. 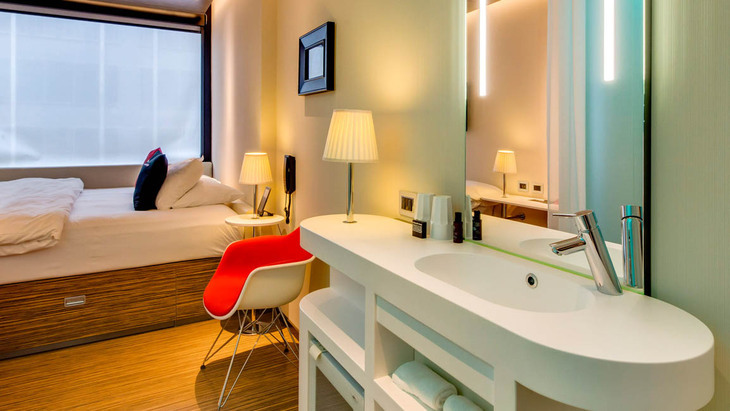 With its sleek trappings, the citizenM hotel immediately stands out. Tailored for urbane, tech-savvy travelers, the property boasts works by Andy Warhol, floor-to-ceiling shelves packed with undeniably cool objects, a private rooftop bar for guests, and more. Hansgrohe's Talis S faucet and Raindance 360 showerpipe complete the hip meets high-design look and were customized for the hotel's guest baths. For your bathroom: fixtures, faucets and accessories. Explore the range of hansgrohe and AXOR bathroom products. For your shower: Shower fixtures, shower heads, shower systems, shower bars and accessories. For your kitchen: kitchen sink faucets and accessoires. Explore high-quality kitchen fixtures of stunning design and functionality. For your bathtub: selected bathtubs created by leading designers. Explore a broad selection of bathroom and toilet accessories of the finest quality and design.